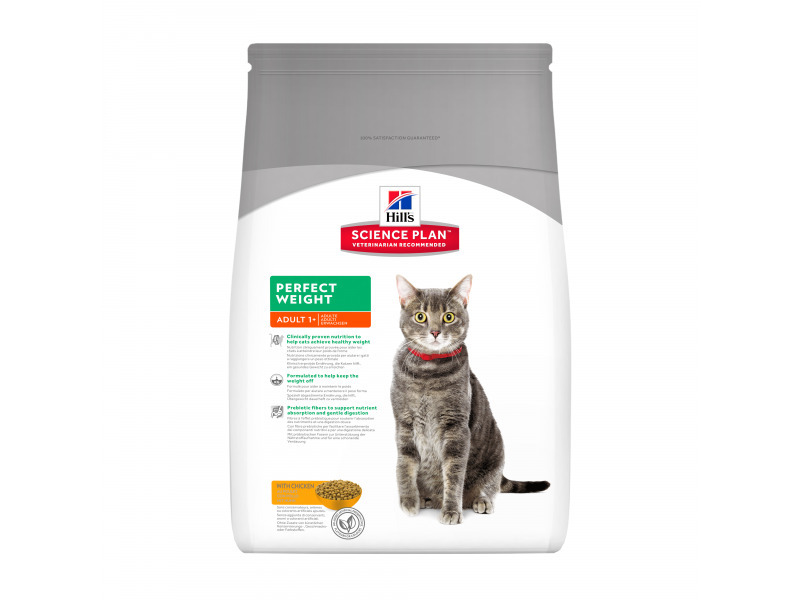 Hills Science Plan Perfect Weight provides a breakthrough nutritional formulation which helps to allow your cat to achieve and contain a healthy weight and improve their quality of life. Contains specially selected prebiotics for a gentle digestion, and contains no artificial flavours, colours or preservatives. Suitable for sterilised cats. Ingredients: Chicken: Chicken (23%) and turkey meal, brewers' rice, maize gluten meal, cellulose, tomato pomace, dried beet pulp, flaxseed, animal fat, coconut oil, digest, minerals, dried carrots, vitamins, taurine, trace elements and beta-carotene. With a natural antioxidant (mixed tocopherols). Pork, chicken, maize, cellulose, maize starch, flaxseed, tomato pomace, minerals, carrots, coconut oil, chicken broth powder, maize gluten meal, carrot powder, spinach flakes, taurine, vitamins, trace elements, DL-methionine, L-carnitine. With natural preservative and natural antioxidants. These ranges are a starting point only because cats’ needs vary. Adjust feeding amounts to maintain optimal body weight. When feeding for the first time, mix increasing amounts of the pet’s new food with decreasing amounts of the previous food over a 7-day period. 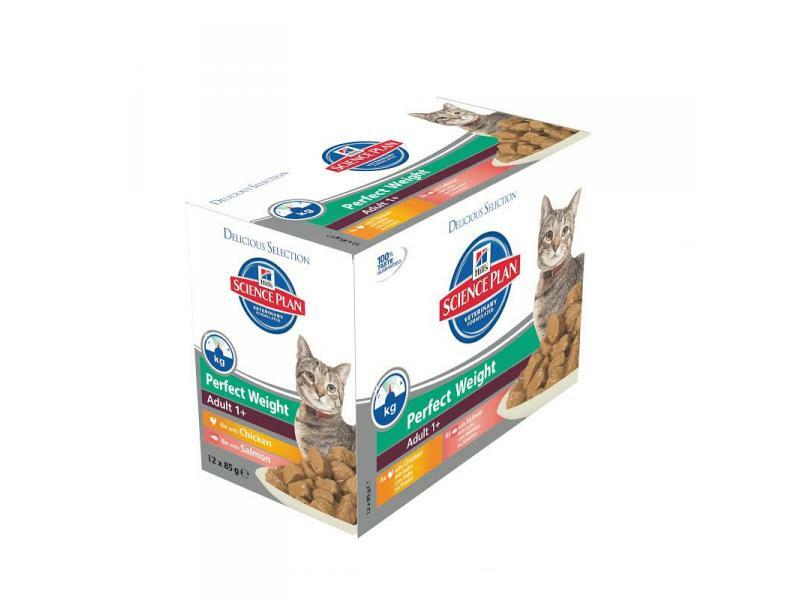 Below are some recent questions we've received regarding Hills Science Plan Perfect Weight Adult Cat Food, including answers from our team. Does the tins of wet food look appetising or does it look like i/d (for example) also would the dried food be enough for a disabled house cat who needs to lose a couple of kilos? The wet food is more of a pate/mousse and contains vegetables whereas the I/D doesn't. Also if your cat has a bodyweight over 30%, we would advise you to seek veterinary advice to ensure your cat is put on a diet plan that best suits his needs. For example, if your cat weighs approximately 5kg and you are trying to get him down to about 3kg, this would not be suitable and you would need to seek advice from your vet.